After having made the critically acclaimed A Streetcar Named Desire film adaptation in 1951, director Elia Kazan teamed up with Marlon Brando once again. This resulted in another beloved classic in the form of On the Waterfront in 1954. Johnny Friendly is a Mob-connected union boss who prides himself over his iron-fisted rule of the waterfront in Hoboken, New Jersey. The police know that he is behind numerous murders, but because witnesses play “D and D”, which is to say “deaf and dumb”, they are wholly unable to mount a case against him. The people choose accept their subservient position rather than risk their lives to inform the authorities of Friendly’s rampant corruption. Terry Malloy, the younger brother of Friendly’s right-hand many, Charley the Gent, makes his living as a dockworker. He is used to coax Joey Doyle, who is slated to testify in court against Friendly into an ambush. Terry assumed Friendly’s enforces were going to coerce Joey into staying silent, but to his shock, they throw him off a roof instead. Now, with Joey’s sister, Edie, vowing to uncover anything she can about Joey’s murder, Terry finds himself in a precarious position when he begins developing feelings for her. It’s impossible talk about the production of this film without commenting on the general political climate of 1954. The HUAC (House Un-American Activities Committee) had formed sixteen years prior to investigate instances of disloyalty, treason, and other subversive activities. They intended to weed out anyone with fascist and communist ties. In 1947, their investigations, indirectly aided by Senator Joseph McCarthy’s anti-communist campaign, led to the creation of the Hollywood blacklist. True to its name, this was the practice of denying employment to screenwriters, actors, directors, or musicians who were accused of harboring communist sympathies. Though the blacklist was rarely made explicit, its damage to countless careers couldn’t be contested. Some such as Charlie Chaplin, Orson Welles, and Yip Harburg, had to leave the United States or go underground to find work while others used pseudonyms. Unfortunately, only ten percent of these people would successfully restore their careers within the entertainment industry. 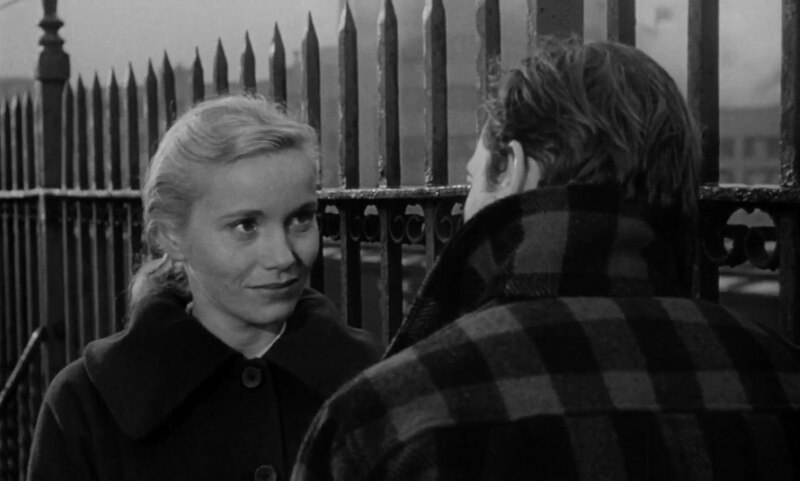 As it turns out, there’s a fair bit of subtext in reality concerning the plot of On the Waterfront. Director Elia Kazan had earned the ire of his colleagues when he identified eight former communists in the film industry before the HUAC. Playwright Arthur Miller, his friend and frequent collaborator, was particularly incensed at him for his actions. Mr. Miller had written the first version of the script with the working title The Hook, but walked off the project when Colombia Pictures executive Harry Cohn asked the antagonists be made communists. This change never occurred, but there were quite a few differences from replacement playwright Budd Schulberg’s original scripts. The most notable revision was changing Terry Malloy from a cynical, divorced investigative reporter to a younger ex-pug dockworker. The end result was a film in which informing the authorities of bad people is the right thing to do. Despite its rather tumultuous production, On the Waterfront became a critical and commercial success when it was released in 1954. It received an impressive twelve Academy Award nominations, winning eight of them, including Best Picture. 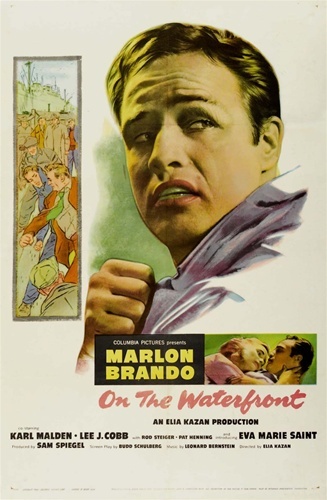 To this day, On the Waterfront is considered one of the hallmarks of fifties cinema. Much like A Streetcar Named Desire before it, On the Waterfront contains an iconic line that arguably transcends the film itself. “I coulda been a contender” is one of those lines that is quoted to the point where its original context is often lost. While often used as a stock reference, in context, it demonstrates just how much Terry has sacrificed himself for the sake of a cause that clearly doesn’t have his interests at heart. He was once a promising boxer before throwing a fight at Charley’s behest. This was done solely to benefit Johnny Friendly so he could win money betting against him. It hammers home that, for all of his bravado, he was nothing more than a pawn in Friendly’s game. As a result, a lot of what makes On the Waterfront such a good film is seeing the evolution Marlon Brando’s character undergoes. Despite being indirectly responsible for Joey’s death and initially being shocked about it, he is remains adamant about remaining silent, treating the heinous crime as though it were a minor accident. As he spends more time with Edie, the more he begins to see the corruption for what it is. The most symbolic moment of his character evolution is when Charley is murdered for his insubordination. It designates the exact moment in which he is freed from the shackles of Friendly’s oppression, and it leads him to take an action he never would have considered at the beginning of the film: testifying in court against Friendly. Interestingly, when Terry confronts Friendly and his cohorts, Mr. Kazan intended for him to die in the ensuing fight. However, the Hays Code, which had been heavily enforced since 1934, prevented this from happening. Instead Terry, barely able to stand, makes his way back to the factory, and it’s implied that the longshoremen follow his example and triumph over Friendly. Though Friendly is still alive by the end of the film, I feel it was for the best that Terry survived as well because it encourages people in real life to follow his lead. Had he died, it likely would have caused some people to remain silent. It’s easy to read this plot as an anti-union allegory, but even knowing of the actions Mr. Kazan took behind the scenes in the years leading up to his film’s release, I think there is quite a bit of applicability to it. I feel it’s ultimately an allegory that encourages people to speak out against corruption no matter what form it takes. It’s better in the long term to stamp out a persistent problem immediately than work around it for many years, thereby letting it fester. On the Waterfront is a classic film that should be seen by anyone with even a passing interest in the medium. It features Marlon Brando delivering one of his most memorable performances, successfully doing justice to the complex arc of his character. In a roundabout way, it reminds me a little of Casablanca in that it’s about a character going against their nature and standing up for what is right. It’s the kind of film that should be studied by creators attempting to insert an allegory into their work because it has something many later efforts lacked: optimism. Giving the audience a sense of hope in the face of inescapable corruption goes a longer way in getting people to stop it than an unending sense of despair would.